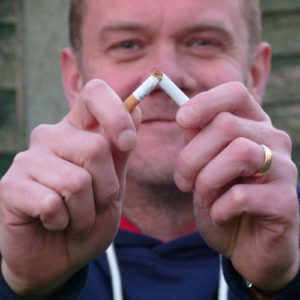 One of the biggest things for me (Dave, The Back Rooms general dogs body) to get ready for a Tough Mudder is quitting smoking, its also one of the reasons for me signing up as there is no way I can smoke 20 a day and expect to finish. Now its only very early on in my journey and I must admit the first 4 days of not smoking were hard, very hard. It was like there was a monster sitting behind my eyes constantly telling me to smoke and driving me mad, would like to say it was the exercise that got me through it, but I’d be lying, it was in fact computer games, something I could completely absorb myself in and forget about everything else. Don’t get me wrong the exercise definitely helped as there is no way I could even dream of having a smoke after one of the work outs Gary Amor provided for me, or even finish the workout if I was still chuffing away. Probably to early to say I am a non smoker (Nearly been 2 weeks but have had many previous failed attempts) but I am determined to keep it up and not return to that lethargic and sickly feeling. To all you smokers out there, its definitely worth a try. Whats the worse that can happen?